One or more suspects broke into the Reno home of Las Vegas shooter Stephen Paddock over the weekend in a shocking security breach amid an intense investigation by the FBI and police. Officer Tim Broadway of the Reno Police Department confirmed on Tuesday that a suspect broke into the home through the front door, Reno Gazette-Journal reported. Broadway said police were not aware of any damage to the home or if anything was taken. Officers immediately notified the FBI. Police raided this home in a quiet Del Webb neighborhood on Oct. 3, two days after Paddock allegedly carried out the deadliest mass shooting in modern U.S. history. Police found five handguns, two shotguns, electronic devices and lots of ammunition, according to Las Vegas Sheriff Joseph Lombardo. FBI agents revisited the home after Oct. 3, FBI spokeswoman Sandra Breault said. She did not confirm the date of the visit, what the agents were looking for, or what they found because the investigation is ongoing. Lombardo confirmed that police and FBI are looking at Paddock’s properties as they continue a search for the shooter’s motive. Paddock bought the home in Reno in 2013. He lived there with his girlfriend, Marilou Danley. Police said they are working with the FBI to make sure there are no further incidents. Paddock’s other home in Mesquite, Nev., was also raided after the shooting. Police found more weapons, explosives and electronic devices there. Lombardo says investigators in search of the motive spoke to Paddock’s entire family tree, including his two ex-wives, according to Las Vegas Review Journal. An autopsy of Paddock’s brain turned up nothing abnormal. He was prescribed an anti-anxiety medicine by a Nevada doctor. Las Vegas police faced new questions on Tuesday over their response to the mass shooting, after releasing a revised chronology in which the gunman shot a security officer before, not after, opening fire from his high-rise hotel window. The updated timeline raised new uncertainty over why Paddock ceased firing on concertgoers once he began, and whether hotel security and police coordinated as well as first believed. 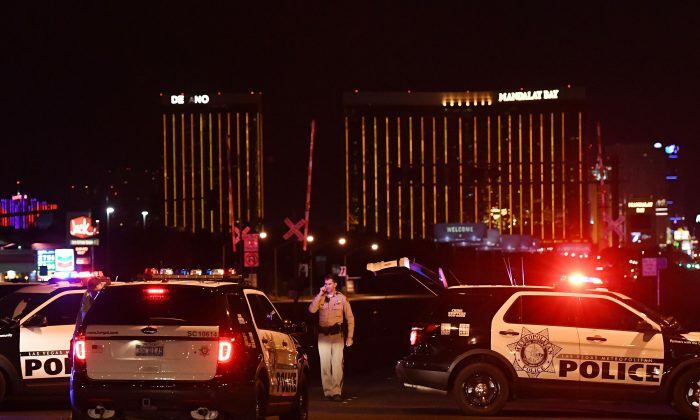 Aden Ocampo-Gomez, spokesman of the Las Vegas Metropolitan Police Department, declined to comment on the revised chronology, saying the agency would discuss the implications later. Paddock allegedly shot himself to death before police could storm his room. Nine days later, his motive remains a mystery. Clark County Sheriff Joseph Lombardo, who oversees the police department, on Monday said Paddock shot a hotel security guard six minutes before beginning to fire on the crowd. By coincidence, the security officer, Jesus Campos, had been sent to check an open-door alarm on the same floor. Officials initially said Paddock began raining gunfire onto the concert first, then stopped shooting after strafing the 32nd-floor hallway through the doorway of his room, when Campos was apparently detected via security cameras the gunman had set up outside his suite. Earlier police accounts said a wounded Campos helped direct police to the room occupied by Paddock, who had quit firing on concertgoers by then. Lombardo originally said police officers reached the 32nd floor within 12 minutes of the first reports of the attack. That sequence of events was changed in Monday’s new timeline issued by Lombardo. “What we have learned is (the security guard) was encountered by the suspect prior to his shooting to the outside world,” Lombardo said. Lombardo did not address whether the mass shooting could have been prevented, or halted sooner, based on the new chronology, but said it remained unclear why Paddock stopped firing on the concert when he did. In an active shooter situation, response time can be as fast as three minutes, said Sid Heal, a retired Los Angeles Sheriff’s Department commander and tactical expert. He questioned why it took police as long as it did to reach the room, if hotel security had called them immediately. “Someone needs to account for those minutes,” he added. Nevada Lieutenant Governor Mark Hutchison acknowledged to CNN on Tuesday that Paddock did not stop firing because of the guard, Jesus Campos, as had been assumed initially. Campos immediately alerted the hotel’s in-house security team after he was shot at 9:59 p.m., six minutes before Paddock first opened fire on the concert, according to Lombardo. But police were not aware Campos had been shot until they met him in the hallway, Lombardo said on Monday. The sheriff has estimated the time of their rendezvous at 10:18 p.m., three minutes after Paddock had stopped firing. Rather than storm Paddock’s suite immediately, police paused to assemble their SWAT team and burst into his room to find him dead 81 minutes after the shooting began, according to the original account. Protocol for Las Vegas hotels and casinos is to barricade the corridor where a shooting takes place and wait for police to arrive, said David Shepherd, a security expert who advises Las Vegas police and who ran the security team at the Venetian hotel on the Vegas Strip for eight years. Police are trained to wait and negotiate with a shooter, rather than storm the room immediately, he said. Initial reports of multiple shooters at several hotels that night would also have confused police, he added. Police and security officers acted as quickly as possible in the circumstances, said David Hickey, the president of the union that represents Campos, based on what he had heard. Officials with MGM Resorts International, which owns the Mandalay Bay, questioned the latest chronology from police. “We cannot be certain about the most recent timeline that has been communicated publicly, and we believe what is currently being expressed may not be accurate,” the company said in a statement late on Tuesday.